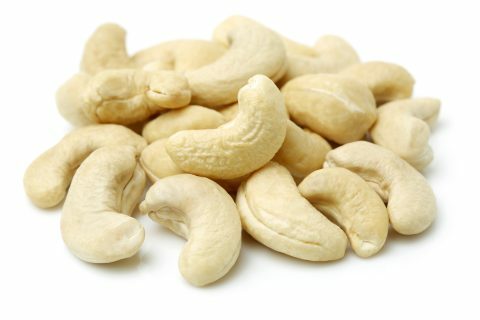 Although a native of the Americas, cashews are mostly known as being of Indian origin, and these days Vietnamese, rather than Brazilian, the cashews’ homeland country. The tree also grows in Mozambique, Tanzania, Kenya, Côte d’Ivoire and Nigeria . Both the Portuguese and the Spanish carried the trees to their colonies during the 16th century. The Portuguese to Goa, India and the Spanish to the Philippines. Interestingly, it grows on the bottom of a pear-shaped fruit called the “cashew – apple”, developing, before the apple, hanging there like an after thought. Cashew nuts are lower in fats than most nuts. They are full of fibre, protein and Vitamin B aswell as copper, iron, magnesium, phosphorus and Vitamin E.